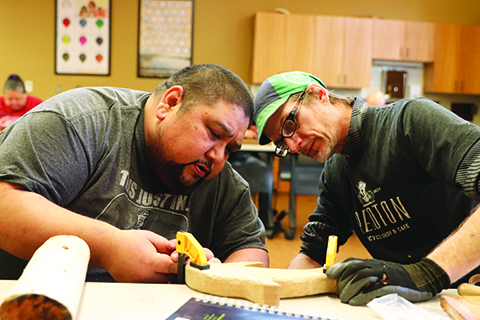 Steven Madison (left) helps a student learn carving techniques. 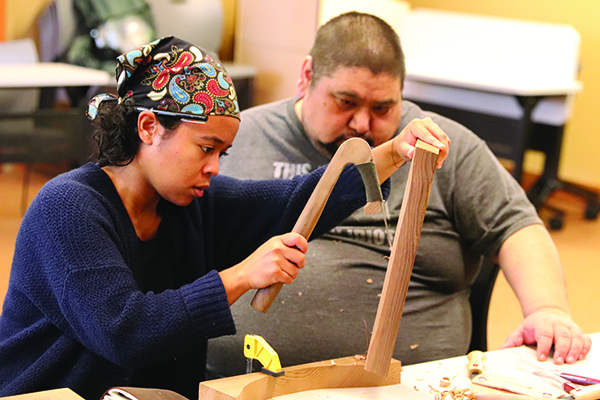 The pleasant smell of freshly cut cedar floated out of classroom 2 of the Hibulb Cultural Center (HCC) on the afternoon of January 19, as a group of ten local citizens gathered for the center’s first Intro to Carving class. The museum enlisted longtime HCC collaborator and Tulalip Master Carver, Steven Madison, to teach the two-part culture series. Wood shavings fell to the floor while the group worked, constructing small projects and exchanging stories and laughter. Each participant was challenged to learn the art of carving in an expedited fashion, picking up new tips and tricks throughout the two, three-hour courses. As Steven bounced about the room, personally assisting each student with their carvings, he introduced them to an assortment of tools such as the drawknife, a two-handed blade used to shape wood, and emphasized technique for safety reasons, constantly reminding the class to pay attention when sculpting their pieces. During the class, Steven carefully used a bandsaw to cut a whale design out of a block of cedar for one of his students. One young lady needed assistance with an adze, a large axe-like tool with a sharp blade used for cutting and smoothing out large pieces of wood. He took a seat next to the student and placed a large slab of cedar on his knee, picked up the tool before advising with a chuckle, ‘don’t do this on your leg’ and began hacking with the adze as strands of wood flew all around him. All eyes appeared to be fixated on the master carver as he gave them a step-by-step tutorial on using the traditional tool. 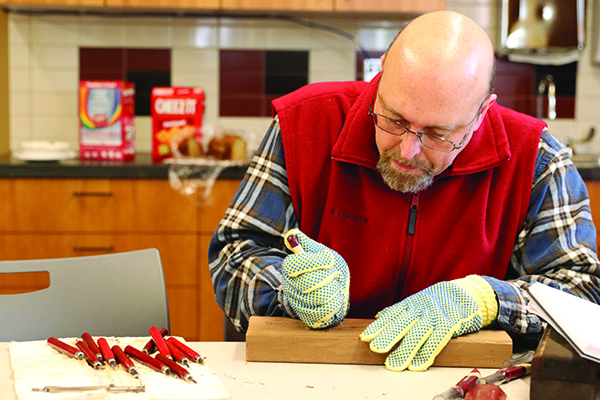 “This all started with me simply wanting to teach people how to use the adze,” Steven recalls. “I did a carving demonstration here last year at the [HCC annual Salmon Bake Fundraiser]. During that demonstration, a lot of people were interested and asked their questions about my technique and the history, so I end up teaching them a lot about carving that day. After that, we decided we might as well do the carving class. The traditional art of carving has been passed down generation after generation. 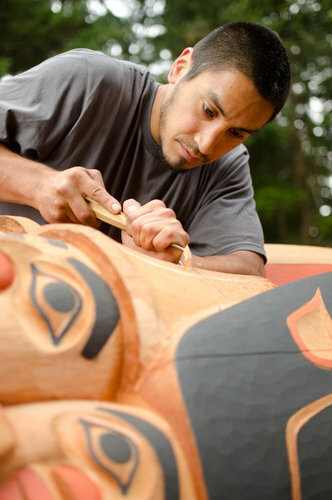 Amongst Coast Salish tribal communities, carving was important to the cultural lifeways of our people. 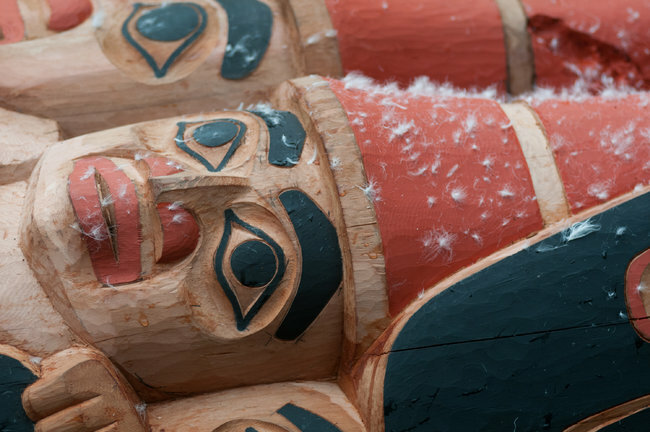 The ancestors carved items for both ceremonial purposes and everyday use, sculpting canoes, paddles, rattles, masks, totem poles and even longhouses out of the spiritual cedar tree. Steven believes this series is an ideal way for beginning carvers to get familiar with the tools and technique. His partnership with the museum extends throughout the course of this year, hosting another Intro to Carving class before starting an in-depth six-week course in the late summer where students will craft paddles and spindle whorls. “The reason we’re doing this is really because we want to keep this alive forever,” states Steven. “That’s why it’s always so good to see the younger generations learning. A lot of kids want to learn but don’t necessarily have the patience for it. I’m one of few people who learned from my grandfather [Frank Madison] and Bernie Gobin. There’s a lot of great carvers, but those are the ones I learned from. There are so few of us left who know the technique of the old ways and the reason why we carve. You can go to anybody to learn how to carve a totem pole, it’s not rocket science, but the reason we do it is because each carving has a point and there’s a story to each one. For further details about the Intro to Carving classes, please contact the museum at (360) 716-2600. A fisherman stumbled upon a rock carving that appears to show a legendary battle in Quileute mythology. As historic finds go, it’s “the most important, at least in this modern day” for the tribe. An old petroglyph found by a fisherman in the Calawah River was celebrated with a ceremony by a group of Quileute tribal members before it was moved to the tribal headquarters in La Push. State archaeologists authenticated the carving and think it may date to around or before the mid-1700s. OUTSIDE OF FORKS, Clallam County — There hadn’t been any good fishing on the Calawah River the day last December when Erik Wasankari and his son Reid found the rock. It was a damp, cold day when the pair, on their lunch break, saw the rock and walked into the river, which was running shallow, to inspect it. It was big — about 2 feet in diameter, with a domelike top filled with grooves and small depressions. Reid scraped off some moss so they could see it better. All Wasankari could make out were “just some triangles and rectangles and shapes,” but he realized they had found something special. “The symbols that we saw were too unique,” said Wasankari, a 44-year-old contractor who grew up in the area and now lives in Gig Harbor. 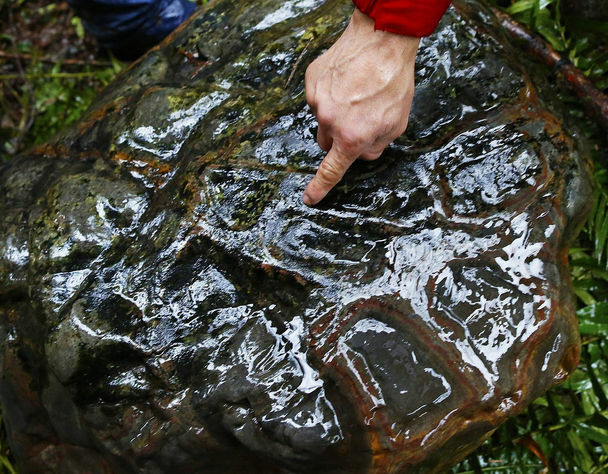 The rock they stumbled upon appears to be a carving that depicts a legendary battle in Quileute mythology, according to tribal and state officials. When tribal and state officials, including Woodruff and state Commissioner of Public Lands Peter Goldmark gathered Wednesday for a ceremony to celebrate the rock’s discovery, you couldn’t walk across the Calawah River. The mud-tinted river was square in the middle of a storm that was dumping several inches of rain on the region and sending whitecaps and dead trees hurtling downstream. The rock — which could weigh up to 1,000 pounds — had been hauled up to the river bank by a power winch. Standing near it just before the ceremony were Lee Stilson and Eugene Jackson. Stilson retired just last week as state lands archaeologist for the state Department of Natural Resources; Jackson is a Quileute tribal member. The two talked about what they could see on the rock’s surface. Stilson pointed out the head of what is believed to be K’wati, a transformative figure in Quileute mythology. With his finger, Stilson traced K’wati’s head, beak and distinctive comb, and then K’wati’s tongue, which leads to another figure on the rock, believed to be the Red Lizard. The tongue is a power symbol and weapon for Northwest tribes, Stilson explained. Jackson, who has done some carving himself, agreed. “Anything that comes out of the mouth is an offensive design — that animal is showing his power,” Jackson said. Stilson and Jackson wondered if the rock could have been a trail marker. “On the 1893 General Land Office map, they show a trail here,” Stilson said. As state archaeologist, Stilson helped authenticate the rock. Whoever carved it used not a metal tool but stone, he said. That means it’s a “pre-contact” artifact, one made before Europeans moved into the region. Stilson guessed it dates to around or before the mid-1700s. Stilson described such a significant discovery as a gift to end his 44-year archaeological career. “It’s a phenomenal work of art,” he said, more than once. The Red Lizard, according to Quileute legend, made his home near the narrowest point of land between the Calawah and Sol Duc rivers and stopped people using it as a shortcut from one to the other. K’wati, a figure of good who was known as the “transformer” and turned the Quileutes from wolves into people, eventually killed the Red Lizard, who had a much poorer reputation. “He was a very bad monster … his urine, actually, if you stepped on it, it would kill you,” Quileute Tribal Councilman Justin “Rio” Jaime told those gathered at the ceremony. The rock will go on display in La Push, as a welcome addition to help tell the tribe’s history. Of this, the Quileute don’t have much — in the late 1880s, a European settler set La Push afire. Along with homes and fishing equipment, the tribe lost almost all its pre-contact artifacts. But Marion Jackson, Eugene’ Jackson’s younger sister, who also came to the ceremony, doesn’t think of the rock as just something from the past. Sophisticated oceangoing canoes and favorable winds may have helped early human settlers colonize New Zealand, a pair of new studies shows. The remote archipelagos of East Polynesia were among the last habitable places on Earth that humans were able to colonize. In New Zealand, human history only began around 1200-1300, when intrepid voyagers arrived by boat through several journeys over some generations. Separately, another group of scientists discovered a climate anomaly in the South Pacific during this era that would have eased sailing from central East Polynesia southwest to New Zealand. Both findings were detailed Sept. 29 in the journal Proceedings of the National Academy of Sciences. The canoe was revealed near the sheltered Anaweka estuary, on the northwestern end of New Zealand’s South Island. “It kind of took my breath away, really, because it was so carefully constructed and so big,” said Dilys Johns, a senior research fellow at the University of Auckland in New Zealand. The hull measured about 20 feet long and it was made from matai, or black pine, found in New Zealand. The boat had carved interior ribs and clear evidence of repair and reuse. 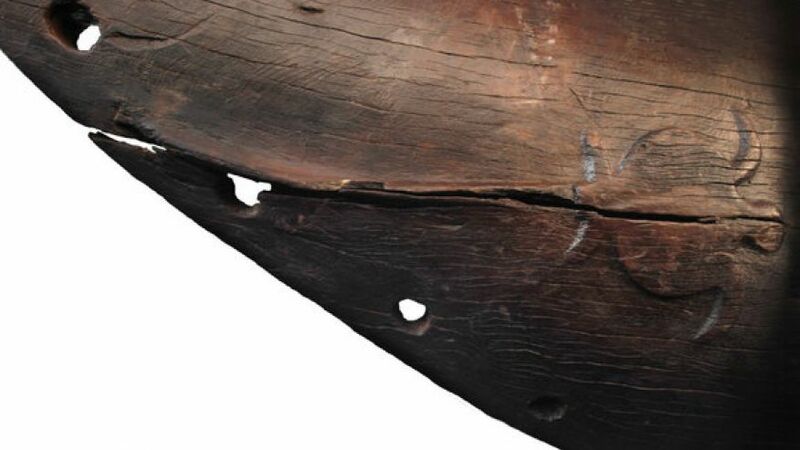 Carbon dating tests showed that the vessel was last caulked with wads of bark in 1400. Johns and colleagues say it’s likely that the hull once had a twin, and together, these vessels formed a double canoe (though the researchers haven’t ruled out the possibility that the find could have been a single canoe with an outrigger). If the ship was a double canoe, it probably had a deck, a shelter and a sail that was pitched forward, much like the historic canoes of the Society Islands (a group that includes Bora Bora and Tahiti) and the Southern Cook Islands. These island chains have been identified as likely Polynesian homelands of the Maori, the group of indigenous people who settled New Zealand. The boat was surprisingly more sophisticated than the canoes described centuries later by the first Europeans to arrive in New Zealand, Johns told Live Science. At the time of European contact, the Maori were using dugout canoes, which were hollowed out from single, big trees with no internal frames. In the smaller islands of Polynesia, boat builders didn’t have access to trees that were big enough to make an entire canoe; to build a vessel, therefore, they had to create an elaborate arrangement of smaller wooden planks. The newly described canoe seems to represent a mix of that ancestral plank technology and an adaptation to the new resources on New Zealand, since the boat has some big, hollowed-out portions but also sophisticated internal ribs, Johns and colleagues wrote. The turtle carving on the boat also seems to link back to the settlers’ homeland. Turtle designs are rare in pre-European carvings in New Zealand, but widespread in Polynesia, where turtles were important in mythology and could represent humans or even gods in artwork. In many traditional Polynesian societies, only the elite were allowed to eat turtles, the study’s authors noted. Goodwin added that a downwind journey from an island in central East Polynesia might take about two weeks in a sailing canoe. But the trip would take four times that if the voyagers had to travel upwind. 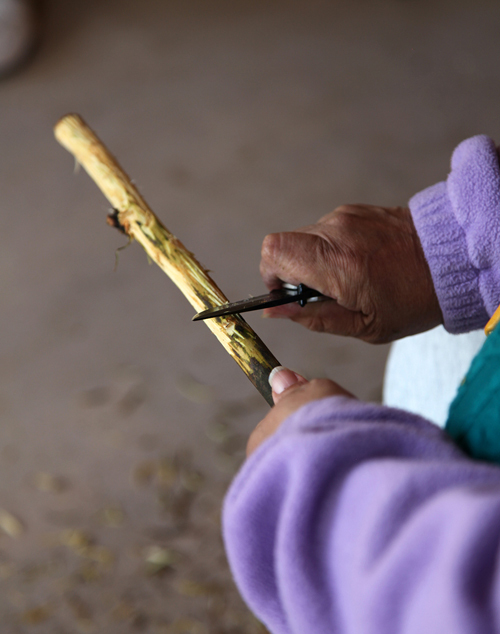 Stripping the bark from the sticks. On April 22nd, members of the Wisdom Warriors support group met up to discuss ways to they can lead a healthier lifestyle. The support group meets on a monthly basis to support each other in maintaining their health goals for living a strong life. Meetings include discussing health topics, enjoying a prepared healthy lunch, and participating in an activity. 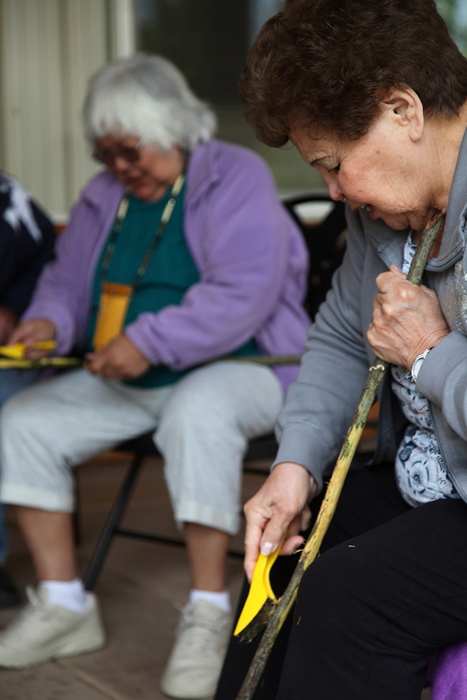 This month, the group carved “salmon sticks” from branches of the Ocean Spray bush that were harvested locally by tribal members. For more information on the Wisdom Warriors, contact Veronica Leahy at 360-716-5642. Tulalip Tribes Health Clinic Veronica Leahy demonstrates “salmon stick” carving techniques. They call themselves the 12th Man — the rabid fans of the Seattle Seahawks who’ve made CenturyLink Field one of the NFL’s toughest arenas to play in. That was certainly the case when, on Sunday, the Seahawks defeated the San Francisco 49ers and in so doing punched a ticket to the Super Bowl. In addition to “12” jerseys and t-shirts, the concept of the 12th Man now has an in-the-flesh personification with Native flair. Or an in-the-wood one, anyway: Chainsaw carver Jake Lucas of Bonney Lake, Washington, has created a six-foot-tall sculpture of a man-bird, wings outstretched, that has proven an instant fan favorite. The carver with Spirit Warrior in the back of his pickup truck. Photos courtesy Jake Lucas. Lucas has some Quinault and Chinook heritage — no more than one-eighth, by his reckoning — and recalls with fondness attending ceremonies and witnessing dances with his half-Native grandmother when he was younger. “I’ve always wanted to carve a Native American dancer,” he says, adding “I also wanted to do something unique to show my love for the team.” The two desires — to borrow a term from woodworking and ornithology — just dovetailed. It took Lucas about three weeks of 12-hour days to make the piece, which he calls Spirit Warrior. The piece was created on Lucas’s own initiative, and hasn’t been endorsed by the Seahawks. But Lucas has been taking it to rallies in the back of his pickup truck, and says the fan response has been overwhelmingly positive. Additionally, he says that the Native American community has also expressed a great appreciation for the carving. Lucas says he doesn’t know where the piece will end up, but he hopes that the Seahawks or perhaps a local Tribal organization would be interested in acquiring it. He can be contacted through his website, chainsawart.org, where you can also see more exampes of the award-winning work he’s been creating since 2004. 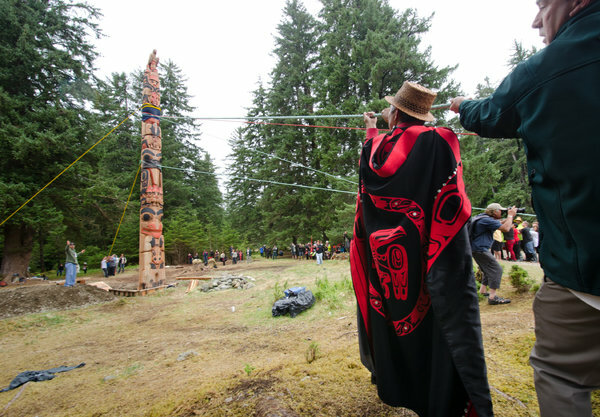 Raising the “Legacy Pole” on Haida Gwaii. The ocean grew choppy and storm clouds darkened the southern sky as we paddled the final miles toward an abandoned Haida village site at the heart of a wedge-shaped archipelago 175 miles in length, 70 miles off the northwest coast of British Columbia. Until recently, this remote chain of islands was known as the Queen Charlotte Islands, but three years ago, the Haida Nation returned that colonial name to the provincial government, in a ceremony using the same style of bentwood box that once housed the remains of the dead. The place is now Haida Gwaii (pronounced HI-duh GWY) — Islands of the People — both officially and, unquestionably, in spirit. The hillsides soaring above our kayaks, scraped bare by clearcutting three decades earlier, were an emerald-hued crew cut, a fuzz of young alder and spruce interspersed with occasional landslides. On a distant ridge beyond stood the silhouettes of giants, stark evidence of where logging had ground to a halt. There is an even older Haida name for this archipelago, which roughly translates to “Islands Emerging From (Supernatural) Concealment.” It is an apt moniker. On these craggy islets — perched on the edge of the continental shelf and pressed against the howling eternity of the Pacific — life exists on such a ferociously lavish scale that myth and dreams routinely mingle with reality. For three days, Dave Quinn and I — neighbors, friends and longtime sea kayak guides — had rejoiced amid a world of windswept islets, breaching humpbacks, raucous seabirds, natural hot springs and solitude. While it was glorious to return to waters we knew so well, there was a deeper purpose to our journey: Paddling from dawn until dusk and then some, we’d been racing north toward Windy Bay. Even as our kayaks crunched aground on its white shell beach, elsewhere bags were being packed, boats readied, float planes fueled. 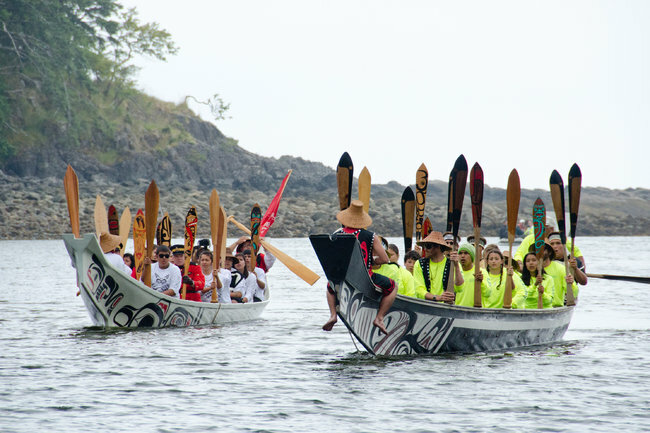 Two great war canoes — long and colorful — were plowing southward from the traditional Haida strongholds of Old Massett and Skidegate, crammed with youth. The next morning, we would all converge here, to witness the raising of a monumental pole (a term preferred by First Nation groups over “totem”) in the southern archipelago, the first such event in over 130 years, since smallpox decimated the local population and left every village unoccupied. That fishermen, loggers, police and government officials would join alongside the Haida Nation in celebration, after decades of bitter land-use conflict, marked a once unimaginable reconciliation — and a way forward extending far beyond these remote shores. Eagle down on the pole. 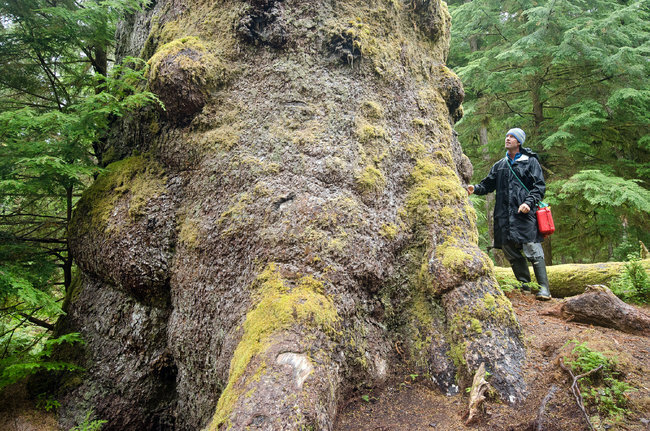 Forty years earlier, a logging company applied to move its clearcutting operations from northern Haida Gwaii — at that time ravaged by industrial-style logging — to this very soil. As John Broadhead, a local conservationist, wrote: “The company couldn’t have been leaving behind an area of more ecological devastation, or moving to one more pristine.” Having witnessed the frontier’s rapacious appetite drive sea otter and whale populations to the brink, the Haida voiced immediate opposition, but it seemed unimaginable that anyone might deflect the logging juggernaut. The ’70s and ’80s were a time of excess and frenzy on this coast, when tens of thousands of dollars’ worth of salmon could be hauled from a single net, and the hewing of trees worth $20,000 each was not uncommon. While the Haida engaged in a decade of fruitless committee meetings, negotiations and court cases, clearcutting crept relentlessly southward. By 1985, the small nation was fed up. Establishing a remote camp on Lyell Island, they settled in for the long haul, standing arm in arm, blockading a logging road and day after day turning back furious loggers who in many cases were neighbors, and even friends. Beyond lay Windy Bay, and some of the last remaining stands of “Avatar”-scale old growth on the coast. Tensions skyrocketed, and soon national news outlets descended. Eight months later a showdown took place and as police officers moved in, a young Haida Royal Canadian Mounted Police officer was forced to arrest his own elders. Over the next two weeks, 72 protesters were shackled and led away. But the images that emerged changed the mood of a nation, and led to an unprecedented agreement between the Haida Nation and the government of Canada. Agreeing to manage cooperatively what, in 1993, would become Gwaii Haanas National Park Reserve, they created an accord now emulated around the world. And while roots of the Haida revival can be traced back to the ’60s — when the lost arts of canoe building, mask making and pole carving began to re-emerge — it was the blockade and the resulting co-management of traditional territory that changed everything. Traditional Haida canoes arrive for the ceremony. Dave and I arrived at the once-abandoned village site to find a hive of activity: electrical generators, an excavator and steaming vats of seafood chowder. At the center of everyone’s attention — though still horizontal — the 40-foot Legacy Pole, celebrating the 20th anniversary of moving from conflict to reconciliation with the establishment of the park. Lying beside a recently constructed longhouse, and surrounded by carvers, its 17 deeply incised figures, all based on the traditional Haida ovoid form, sprang from luxuriant cinnamon-colored cedar. Although the raising was just 24 hours away, plenty of work remained to be done. Penciled design lines were shaved away, even as traditional black and red paints were applied. (The red, interestingly, was “Navajo” from Benjamin Moore.) Jaalen Edenshaw, the lead carver, quietly shaped a raven’s eyes as he told us of selecting a living tree from the forests. Alongside two apprentices, he had shaped the pole for an entire year. Among the many modern stories depicted in his design was the blockade, symbolized by five protesters with interlocked arms. With an eagle at the peak and a sculpin fish at the foot, the pole also tells of Gwaii Haanas becoming the first area on the planet to be protected from mountaintop to ocean floor when a National Marine Conservation Area was added to surrounding waters in 2010. Amid the crowd was Guujaaw (pronounced GOO-jow), Mr. Edenshaw’s father and the widely recognized former president of the Haida Nation, who had stared down decades of negotiators and became emblematic of the Haida’s dignified, nonviolent resistance. Suddenly, above the hubbub, came a cry: “Guuj! How about a birthday song?” The war canoes had arrived, and one of the young paddlers was celebrating a birthday. Guujaaw raised a skin drum, its rhythmic beat echoing through the forest like a heart. As he launched into a forceful chant — “Hey hi yo, ha wee ah” — everyone joined in. The young birthday boy rushed forward, dancing a traditional Haida stomp, knees deeply bent, arms in the air. Then, as quickly as it began, the song ended, and the carvers returned to their work. Dave Quinn stands beside a giant tree near the Windy Bay village site. The next morning we woke from our tent to find an immense Coast Guard cutter anchored offshore, surrounded by an armada of smaller fishing vessels. Zodiacs began shuttling dignitaries, elders, children and curious visitors ashore. By noon, more than 400 people had gathered — unquestionably the most to stand on these shores since the village was abandoned 150 years previously. By early afternoon the skies had cleared. Chiefs gathered in ceremonial headdresses adorned with ermine skins and sea lion whiskers. Blessings were given, speeches made. A bare-chested man in a nightmarish mask danced to clear away malevolent spirits, and afterward, a matriarch splashed water over the pole, purifying it. Children followed, tossing handfuls of fluffy eagle down that floated on a soft breeze. Six immense ropes — two inches in diameter — had been lashed to the top of the pole, and at last the assembled crowd was directed to find places on each. Weighing 7,000 pounds, the pole was relatively light, but a weathered Haida fisherman explained that any pole raising can be dangerous. The countdown began. Boots bit into mud, backs heaved, and the great pole floated skyward. In a blink it was up. A few more hoarsely shouted instructions — “Pull on the yellow rope! Ease off on blue” — and it stood vertical. Cheers erupted. Boulders were rolled into the deep hole at its base, pounded in place with long wooden beams. Shovel after shovel of gravel followed. Later, 14 elders who stood on the line were introduced. As drums beat and dancers danced, Miles Richardson — who led the resistance during the blockade — uttered once again the words heard on newscasts across Canada: “We are here to uphold the decision of people of the Haida Nation. There will be no logging in Gwaii Haanas anymore.” The deafening applause was that of a nation whose history now lies newly ahead. 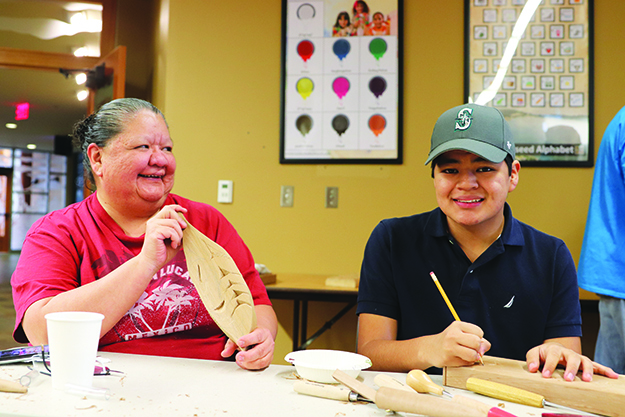 Tulalip Hibulb Cultural Center is celebrating two years of sharing Coast Salish culture and highlighting the stories, people, art and history of Tulalip. 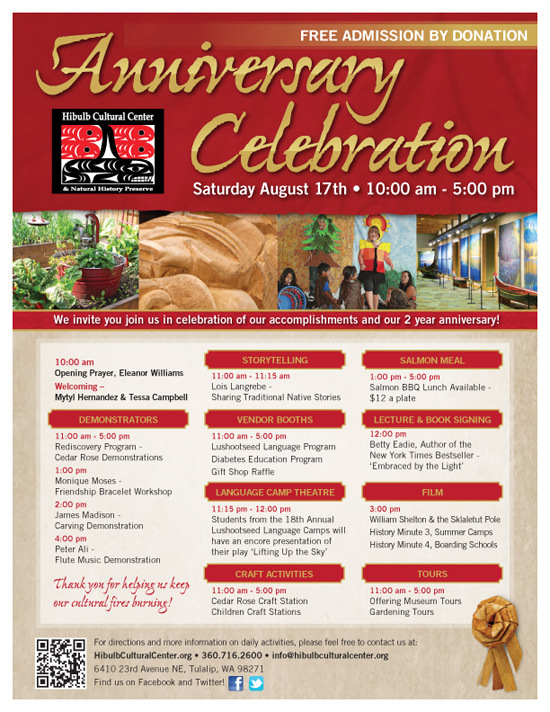 Saturday, August 17, 10 am to 5pm. 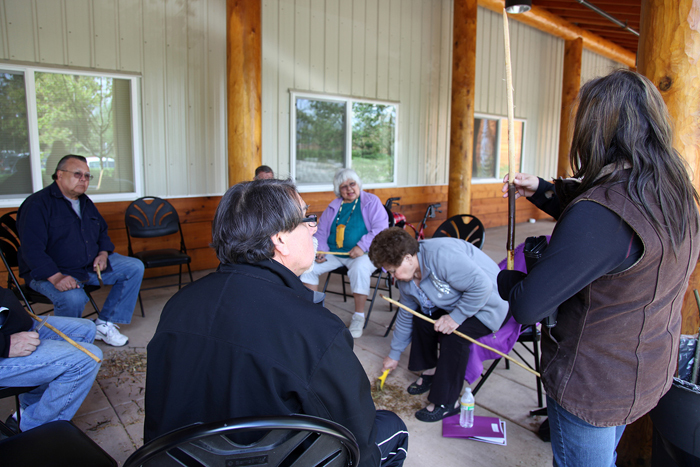 Included in the activities are carving, beading and flute music demonstrations, storytelling, craft activities, a salmon lunch and a special performance by the Tulalip Lushootseed Language Camp students.